Digital keys for delivery directly to the car trunk get the warehouse rolling. With an end-to-end solution by T-Systems, tradespersons now get their material directly into the vehicle over night. The solution was developed with Mov’InBlue, a cooperation between Capgemini and the automotive supplier Valeo. Customers of the wholesalers network of GC-GROUP can use this service nationwide in Germany. Getting up, getting on and going straight to the construction site: this is how comfortably the day begins for Germany’s tradesmen. The solution Mobile Identity & Access (MIA) for in-car delivery uses Mov’InBlue’s digital car key. In the MIA app, Deutsche Telekom’s corporate customer arm T-Systems combines the functions for authentication and access. The end-to-end service includes connectivity up to the cloud platform. It is customized to companies’ process chains. The servers for the platform are located in Germany. Mov’InBlue’s team equips the tradesperson’s vehicle with a telematics box on site. It is approved for installation without restriction. Whether water taps or sanitary ceramics: Installers can order everything they need the next morning for their customers via the GC ONLINE PLUS platform until 8 p.m. The GC employees compile the order and plan the delivery. Using the MIA app, the driver of the wholesaler finds the craftsman’s car and can open it. Security and data protection are of utmost importance. The entire process complies with German data protection guidelines. The location data of the tradesperson’s car is secured: The app will not process them before the installer orders. The digital key is generated once. It is encrypted and only valid in a certain time slot. 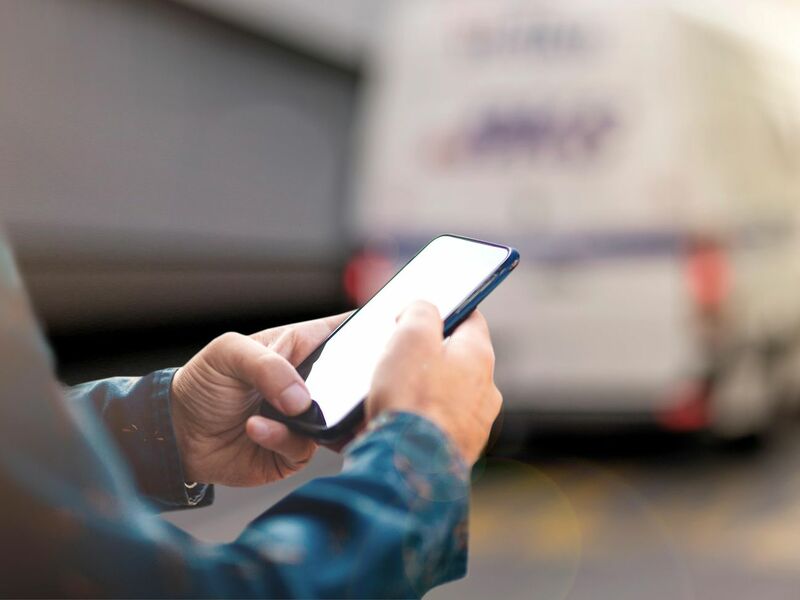 With Mobile Identity & Access for in-car delivery, the entire process chain from order to proof of delivery lies in Deutsche Telekom’s highly secure cloud. The Mov’InBlue cloud generates the unique virtual key for the respective vehicle. Only the driver of the delivery vehicle receives this key via a message on his smartphone. The smartphone contacts the telematics box in the craftsman’s car. The box checks the validity of the key and unlocks the vehicle. CG’s driver can only open the vehicle when he is on site. And only if the craftsman has released it. If another driver is commissioned, the authorizations can be changed securely and are traceable. “The communication between the smartphone and the telematics box for the locking mechanism is highly secured and using the encryption deployed for mobile payment,” explains Dominique Doucet, Valeo Comfort and Driving Assistance Digital VP and Director of Mov’InBlue. In the end, the warehouse receives proof that the delivery was successful.